Imagine this scenario: You are nearing the place in life where many of your peers are considering retirement; you have had a successful and fulfilling career in both the public and private sectors; you are now happily working for yourself as a consultant, helping others with the knowledge you have gained over your career. Out of nowhere you receive a phone call from the governor of your home state with a unique and challenging job offer. This is exactly what happened for Glenn McCullough, Jr., who was named as the executive director of the Mississippi Development Authority (MDA) on June 8, 2015. The last six months have been a whirlwind of learning, travel, and activity, but he’s been well prepared for this new position by the course of his life. He attended public school in Tupelo before matriculating to Mississippi State University, where he earned a bachelor’s degree in Agricultural Economics. After graduation, McCullough spent 20+ years working in private industry, including with an industrial pipe business owned by his sister. In 1992, he began the second phase of his career, working in public service. 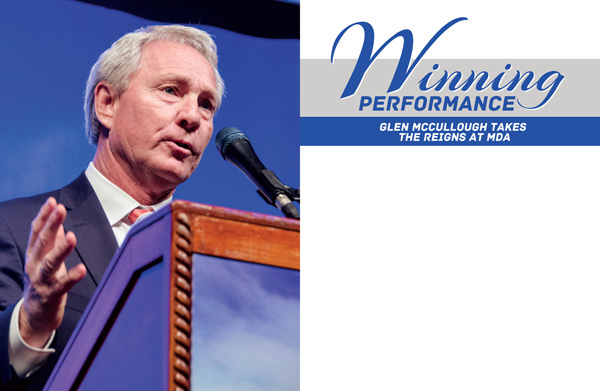 McCullough’s time in public service includes a time with the Appalachian Regional Commission of the MDA (1992-1997), 5 years as the mayor of Tupelo (1997-2001), and 6 years on the board of the Tennessee Valley Authority (TVA), appointed in 1999 by President Bill Clinton, and later named chairman of the board by President George W. Bush (1999-2005). After leaving TVA, he had yet a third phase of his career, this time spending 10 years in private business consulting and serving on the board of several corporations. Then came the call from Governor Phil Bryant, for Glenn McCullough, Jr., to become the executive director of the Mississippi Development Authority. McCullough feels that we are well positioned in this state; we have a good businesses climate, and he is committed to maintaining the type of atmosphere that attracts and grows businesses. Along with support for industry from the executive and legislative branches, other important elements of a positive business climate include low taxes, reasonable regulation and licensing, low energy costs, and other fiscally conservative practices that businesses prefer. 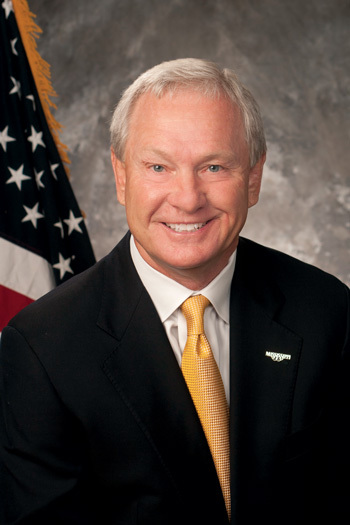 When asked about his vision for the MDA, how he would like to see the department running during his tenure, McCullough mentions four concrete things he would like to see — achieve excellent performance in economic development, communicate clearly with partners, internal and external departmental accountability, and working better with industry partners to see industry area growth. He hopes to accomplish these goals by finding optimal leadership, developing good teams and partner relationships, and continually raising the performance bar both for himself and those around him. One of the first significant steps guided by McCullough to help secure Mississippi’s economic future budget is the recent submission of a performance-based budget. The state legislature wanted to see performance-based budgets from the departments, and MDA was the first to put one together. This budget will help legislators and policymakers understand exactly how MDA is using funds to help improve areas like workforce development. Some of the key measurements of performance for the MDA will be a growing economy, a growing GDP, new and better jobs, and more Mississippians employed. Another area of specific focus for the MDA will be workforce development. They assisted the State Workforce Investment Board in putting together a comprehensive workforce development plan for Mississippi, including more vocational training centers and industry-specific training programs at community colleges. MDA is dedicated to making sure that potential employers know that Mississippi has a willing and able workforce, and if technical or vocational training is needed for certain jobs, Mississippi also has a way to ensure that can happen. The MDA also has an increasing focus on tourism in Mississippi. We had over 22 million visitors to our state in 2014. These visitors are exposed to our people, our industry, universities, manufacturing, food, and culture. Says McCullough, “People come here with certain ideas in their head, but they leave impressed, stereotypes are smashed, and good things get spread about our great state.” The state’s tourism department, Visit Mississippi, is a part of the MDA, and they are hard at work getting the word out about Mississippi as a destination spot, using forums ranging from their website, www.visitmississippi.org, to social media to international trade missions, and everything in between.